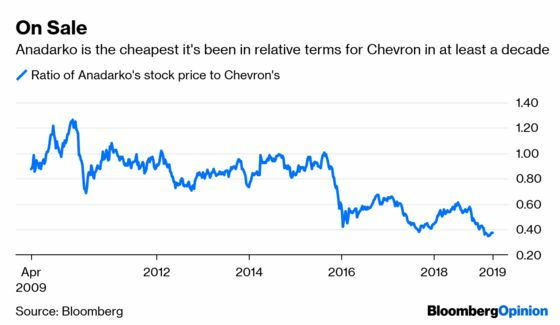 (Bloomberg Opinion) -- There were just too many questions hanging over Anadarko Petroleum Corp. Now Chevron Corp. has provided the answer: a $50 billion acquisition. The deal exemplifies what’s happened in shale-landia over the past few years. The premium of 38 percent immediately grabs attention. But to really understand where Anadarko was coming from, focus on the price: $65 a share in cash and stock. Anadarko is being taken out at a price where it traded barely six months ago – despite oil prices making back most of the ground they lost in late 2018. Anadarko was trying, but nothing really seemed to work. Like oil, its stock used to trade above $100. Then the crash exposed it on multiple fronts. Having made an ill-advised tilt at rival Apache Corp. in late 2015, Anadarko eventually took a series of solid steps to regain trust, cutting costs, boosting payouts and reforming management compensation. Yet it remained hampered by its identity as a mini-major, spread across the world and lacking both the scale of a true oil major and the focus of large frackers concentrated in the U.S. Anadarko’s position in Mozambique, for example, has huge potential, but there was an equally huge question of how it would finance development. At the other end of the scale, despite Coloradans rejecting a restrictive ballot initiative related to fracking, uncertainty about the political environment surrounding one of Anadarko’s core assets persists. The company’s cost structure presented another quandary. It missed estimates by a lot last quarter, and Anadarko screens poorly on overhead spending. Chevron addresses all of these – in part because its own model has moved a little closer to Anadarko’s. While the latter is taking a price near where it traded only six months ago, shareholders will get a roughly 9 percent stake in what looks like a bigger, better-positioned version of what they had anyway. A few years ago, Chevron was a diversified oil major mired in developing giant liquefied natural gas projects. Now it’s more leveraged to oil prices and higher growth due to putting U.S. tight oil front and center in its plans. Anadarko’s Permian position adds to that, with acreage nestled snugly against Chevron’s own. Chevron also has the scale (and hard-won experience) to handle Mozambique and also to absorb the risk in Colorado, or sell out if need be. On the cost front, Chevron’s $1 billion annual synergies target is equivalent to taking out Anadarko’s entire SG&A line. 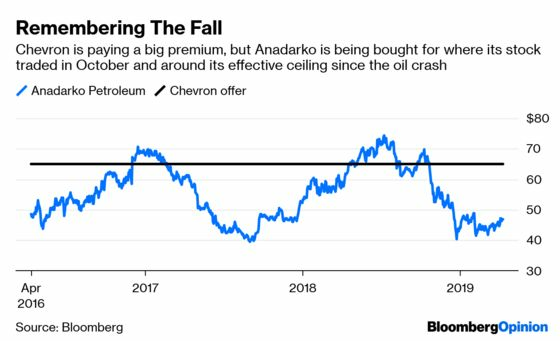 Meanwhile, Anadarko’s investors would get an immediate 1 percentage-point boost in their dividend yield, plus the promise of an ongoing buyback program backed by Chevron’s better balance sheet, free cash flow and an expanded disposal program. Factoring in synergies and using consensus estimates, the deal implies a return on capital employed of about 9 percent – not a slam-dunk, but high enough considering the potential to high-grade the combined portfolios. This deal inevitably raises the question of who’s next. The Permian basin is highly fragmented, leading to inefficiencies, such as Anadarko’s high overhead spending, that activists have begun to target. In the context of the majors, the companies that spring to mind immediately are those that, like Anadarko, combine a U.S. tight-oil position with some material assets overseas, such as Noble Energy Inc. and Hess Corp. It should be noted that both of these have a link to Exxon Mobil Corp. via shared positions in big development projects in the eastern Mediterranean and Guyana, respectively. Both stocks jumped Friday morning. We are coming off a decade of land grabs and frenzied fracking that did wonders for America’s market share in the global oil market but less so for the investors funding it. Meanwhile, oil majors appear to have recognized that the old playbook of developing mega-projects and banking on an upswing in the cycle no longer cuts it with investors. Those, like Chevron, that have embraced shorter-cycle assets such as shale and bigger payouts have been rewarded. In other words, they have lower-cost capital to deploy in a high-potential part of the business that is being starved of it. Anadarko bowing out for $65 really does say it all.